Before moving onto 10 Unexpected Wedding Entertainment Ideas it’s a great idea to look at an absolute essential- live music. A live band is a great way to bring a party alive! For those searching for the best wedding band in the Melbourne and Sydney areas, look no further than Lily Road. We offer the best wedding band, the best wedding singer, and the best songs for weddings for every part of your reception. Our band members are highly experienced and qualified, having worked with artists such as Aerosmith, John Legend and Maroon 5. All our wedding singers have proved their talent on shows such as X Factor, the Voice, and Australian Idol. Our selection of songs for weddings is diverse, consisting of today’s hits as well as those from the 70’s, 80’s and 90’s. We also provide various styles of music including jazz, pop, rock, funk, blues, hip-hop and more. Lily Road will provide your guests with a night of wedding entertainment they’ll never forget! Beyond Lily Road’s talent, are you looking for additional ways to entertain your guests? Perhaps something a bit quirky and unexpected that will make them laugh and keep the fun flowing? We’ve compiled a list of the best, unexpected entertainment ideas to make your day the most talked about event in town. 1 Dance Lessons – Instead of hoping your guests will dance, why not provide an instructor who can teach them? Choose something they can all learn and do together. Make it meaningful by tying it into your ethnic background or personal interests. To maximize fun, keep your lesson to ten minutes or less. 2 Have a Dance Off – It could be guys against girls or kids against adults. Anything goes – and you can let Lily Road decide the best, the worst and the winner! 3 Flash Mob Dance – Do you have friends and family who would be willing to participate? Set it up ahead of time so they can learn the routine, then turn them loose at the reception. Be a part of it yourself and surprise everyone! 4 Singing Waiters – What’s better than a waiter who gives great service? One who sings, of course! Keep your guests on their toes and smiles on their faces with waiters who serve with a song. 5 Caricatures – Looking for a party favor guests will want to take home? Hire someone to draw caricatures to make it personal and fun. 6 Photo Scavenger Hunt – Create a scavenger hunt for guests to complete throughout the day. Hand out the list at the ceremony and let them check it off by taking selfies with the wait staff or a pic of them kissing the groom’s cheek. Coin a special #hashtag and post the pictures to Instagram for added competition and fun. 7 Celebrity Guests – Is there someone you’d love to invite because you know they’d liven up the party, but they’re out of your league? Hire impersonators to mix with the crowd. From Elvis to Captain Jack Sparrow and beyond, the possibilities – and fun – are endless! 8 Wedding Piñata – Why save the games and prizes for the kids? 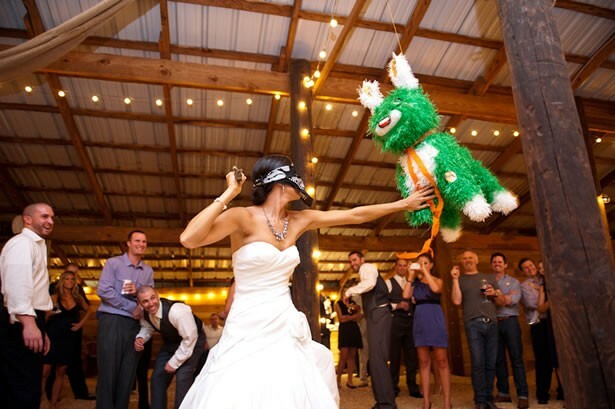 Bring a piñata to the reception. Bride and Groom get first dibs and then the guests can take a whack. 9 Food Trucks – Food is an important part of the reception – from cocktails and hors d’oeuvres to the meal and dessert – this is something the guests will remember. Instead of a chocolate fountain or a sundae bar, take it to the next level. Hire an ice cream truck for dessert. Or if you’re adventurous, plan the entire menu using food trucks! 10 Cue Cards – Why save all the fun for the reception? Use cue cards during the ceremony. Give them to your bridal party or designate certain guests. They could say things like Forced Laughter or Big Sigh. While these are our top ten picks, the list doesn’t end there. Think outside the box and have fun. There are many ways to make your big day unique and memorable.